General prospects for Spaniards are not promising, and, in many cases, worse than in 2011. So in what sense can it be said that after 15M, mentalities have changed? Juventud Sin Futuro,15M. 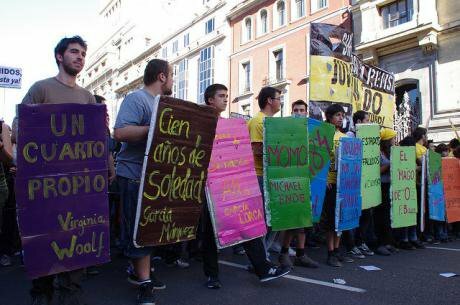 Madrid, May 15, 2011. Flickr/Daniele Grasso. Some rights reserved. The lack of political alternatives to the impending municipal elections, which would sweep the Popular Party (Partido Popular) to power; the first major social cuts initiated by Zapatero's socialist government and the devastating effects of an economic crisis that had lasted for 4 years and which painted a grim prospect; were the fundamental reasons for the articulation of a series of mobilizations that would change the Spanish political and social panorama. 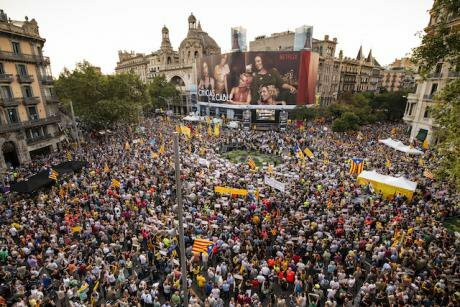 The facts are well known: almost a month of camping, demonstrations in more than 60 Spanish cities, more than a million people in the streets, more than 500 assemblies around the world and a series of parallel and sister mobilizations, such as the different occupy movements. Traditional policy did not fulfil the aspirations, needs and demands of an important part of the general public and thus 15M was born, internationally known as the Indignados Movement (anti-austerity movement). Shortly after this expression of social dissatisfaction, these mobilizations, resulted in the birth of political formations, among which Podemos stood out when 4 years after 15M, the party which was a coalition with other new formations, managed to gain access to government in several Spanish cities, besides acquiring a remarkable relevance and political representation in almost all of Spain's regions and at the state-level. Although 15M continues to exist as a residual social movement, with several active assemblies and a certain presence in the virtual world, the birth of these new political formations and their rapid process of institutionalization has overtaken their main demands and channels of action. In this sense, and despite the speed of the whole process, we could ask ourselves if 15M's foundational and articulating objectives have been achieved or not, and if so at least to what extent. If we can show some relevant after-effects, are these positive or negative ? Some continuities and other political and social transformations may be discerned, but their impact may well take some time to materialize. From the point of view of the great demands in the macrosocial field, the one true thing is that the general prospects for Spaniards are not especially promising, and, in many cases, worse than in 2011. According to Labour Force Surveys, although unemployment figures have eased for all age groups, reaching around 16% by the end of 2018, youth unemployment continues being structural, with dramatic data for young people between 16 and 19 years at above 50%, as well as for those from 20 to 24 years old being above 30%, and for those from 25 to 29 years old at above 20%. Moreover, we need to add precarity into the picture since more than 90% of the contracts signed in 2018 were temporary, the highest figure in the European Union. According to the latest Living Conditions Survey from the National Institute of Statistics, 22.3% of the Spanish population is below the poverty line and 31.3% of children in Spain are at risk of poverty or social exclusion. The differences between rich and poor in Spain have increased markedly, placing us third as the country with the greatest inequalities in the EU. While 70% of the population has seen their economic situation worsen since before the crisis began, during that same period the number of millionaires has tripled, showing that data on economic recovery has only affected people with high incomes. The housing problem persists, in addition to the more than 700,000 families who have lost their homes since 2007 (more than 300,000 since 2011). The price of rent and property has increased, reaching figures similar to those before the real estate bubble's explosion. The increase in house prices, which could be analyzed as a clear macroeconomic indicator of an exit from economic crisis, is again an indicator, however, that this exit has not benefited the society's most vulnerable strata, such as young people. Young people’s ‘emancipation age’ – that is the age at which they leave their parental home to live on their own – has gone up in recent years. According to data from the Observatory of Emancipation in 2017, less than two out of every ten young people in Spain leave their parents' house to live on their own, the lowest data since 2002. A young person must allocate 57.9% of their salary to be able to acquire a property and must earn 4.1 times their salary to cover the amount needed for a down-payment on a house in trade-in value. If a young person chooses to rent, they would need 69.3% of their salary to meet the monthly amount. The university, public education and the public health system have not recovered to their pre-crisis levels. They continue to cut their budgets, and the same is done to scholarships and other benefits, while, for example university fees increase. Finally, and taking into account GDP, it is true that since 2014 (the first year in which GDP has risen since 2008, by 1.4%), Spain has grown, but since 2015 when it had reached 3.5% it has produced a slight but steady decrease, around 1%, accompanied by a scandalous and worrying increase in public debt, almost 100% of GDP, 30% more than in 2011 and 70% more than at the beginning of the crisis. If macroeconomic data does not show a palpable dent in the neoliberal model, from the point of view of liberties, democracy and dignity, the situation is not promising either. In 2015, the Popular Party approved the so-called Gag Law (La Ley Mordaza), as a direct response to mobilizations that demanded political responsibility for corruption and that encouraged democratic change. This law established new crimes of information, assembly and demonstration, undermining freedom of expression with the scandalous arrests of activists, artists and journalists. The sentences meted out for the glorification of terrorism, many due to simple jokes on social networks, have increased four-fold since 2011, the year in which ETA also announced its permanent cessation of violence. There are also arrests, convictions and imprisonments for insults to the Crown, offending religious feelings and even for making jokes about Franco. On the other hand, Catalonia's independence process, which was dealt with by both government and police by deploying an unusual amount of violence, has led to the imprisonment without bail of several Catalan politicians who are awaiting trial. At the same time corruption, which is already endemic and structural in Spain, and which costs Spanish taxpayers about 100,000 million euros a year – one of the fuses that ignited 15M and the birth of the new parties – has entailed few repercussions for the traditional parties. It is true that there have been a good number of politicians who have been convicted and imprisoned, several ministers, autonomous presidents, deputies and mayors. The Popular Party is even the first political party to have been condemned for corruption in Spanish history. But the electoral prospects of the leading parties have not been seriously affected. It is important to remember that the Popular Party has won all the general elections and in almost all Spanish communities and cities since 15M emerged, and that by contrast the vast majority of progressive governments have arisen through pacts between the Socialist Party and Podemos or their allies. There does not seem to have been an impact on the general public concordant to the size and magnitude of the crimes of corruption committed, especially in the regions most affected by these crimes. The truth is that the concept of democracy, the defense of social rights, freedom, equality and the spirit of coexistence are not going through their finest moment in Spain right now. The process of Catalan independence has revived the most rancid nationalist Spanish feelings; awakening xenophobic attitudes on both sides, dusting the arguments off and even going so far as to legitimize the Franco dictatorship. This process of radicalization or awakening of ideologies aligned to those of the far-right has been reinforced by the refugee crisis, also increasing the rejection of immigrants in Spain. Thus, new parties and political groups belonging to the far-right have emerged and many of the most reactionary arguments have even been taken on and defended by moderate parties (Álvarez-Benavides, 2018). The barometers of the Sociological Research Center (CIS) from 2017 and 2018 show how both individual ideological self-location, as well as that of the parties, as well as the agreed definition of the main problems of Spain, tend towards increasingly conservative, radical and exclusionary positions. The intentions and demands of the post-2011 social movements, including 15M, were tremendously ambitious and hopeful. But the political, social and economic reality at national and international level instead carries a certain sense of disaffection and failure. However, there are also a whole series of reasons to be optimistic, changes and new trends that have their origin and their being in 15M. The most obvious are the new political parties. At the national level, Podemos stands out, with delegations in all the autonomous communities and in the main municipalities. But other types of regional groupings have emerged, such as AhoraMadrid, Barcelona en Comú, la marea Atlántica, Zaragoza en Común, etc. Through pacts with other parties and initiatives from the left, these groupings have accessed several autonomous parliaments, ruling in coalition and even reaching the mayorship of cities such as Madrid, Barcelona, ​​Valencia, Cádiz, Zaragoza and A Coruña. These are the so-called "governments for change". The process of institutionalizing these new parties has been dizzying, its initial fresh zeal having been lost along the way and perhaps the most transformative and ambitious aspirations along with it. This has generated criticism (Álvarez-Benavides, 2016), but also some stability. While the initial perspective called for a storming of the heavens, as Pablo Iglesias once put it, at present the social mass that sustains these new parties and governments seems stable, which allows for some medium-term political planning. The incoming governments for change policies have had an open social character. The initiatives surrounding public housing, the remunicipalisation processes of basic public services and the control of national and local economic oligarchies, stand out, having established important fines for non-compliance with services. All processes of privatization of hospitals and other public services have been stopped in their tracks. There has also been a significant boost to environmental measures, working to make cities more sustainable, friendlier towards citizens, restricting the usage of cars, increasing green spaces, pedestrianizing large spaces. These radical municipal groupings have also proven to be excellent managers, reducing public debt at a much higher speed and to a much greater extent than the municipalities and communities in which traditional parties govern, while at the same time increasing social spending. Despite the resistances, the difficulties and the short time spent, the new policy is building a democracy that advances the recovery and extension of social rights, in which corruption is punished with strict self-imposed ethical codes, with a greater budget transparency, and with a commitment to the general public and to large corporations' detriment. These new policies have brought with them, therefore, a better democracy, but also more democracy, with the implementation of a whole series of participatory processes that range from participation in the municipal budget's management of parcels to the design and rehabilitation of public spaces. Many of 15M's demands have been permeating into the new politics and the new parties, but the new faces, the new generations, the new ethical dimension of the new progressive governments, also has its counterpart, at least to some extent, in the general political sphere, as well as in the traditional one. Beyond the advance of some reactionary ideas, the truth is that at the same time the ideas of the new policy have permeated into the traditional parties, the ethical codes of the parties have hardened and there is a greater control on the citizens' influence over policy and politicians. Although this does not directly translate into a majority change of tendency in the vote, it does so with respect to its legitimacy, even by the most conservative voters. This reformulation of political legitimacy has resulted, for example, in the fact that after the Popular Party was condemned for corruption, the remaining political parties of the Congress, with the exception of Ciudadanos, dissolved the government of Mariano Rajoy through a no-confidence motion, which in turn provoked a process of political renewal in the conservative party. Despite the fact that corruption continues to be a plague, it is punished more and more in the judiciary, with model and exemplary condemnations, and with almost 1500 politicians charged and a hundred in jail, including the King's own brother-in-law. Today it seems unlikely that a politician charged with corruption will not end up resigning. But these constraints exercised on the general public's behalf and the politicians themselves are being more and more extended, so that, for example, in the new socialist government two ministers have resigned for ethical reasons (the minister of health for doubts generated around her claims to a master's degree and the minister of culture for having been fined for tax-evasion before becoming a minister). There have also been similar resignations in the Popular Party and other formations. 15M, the "Indignados" movement, has had a very important symbolic and pragmatic dimension to it, such that this has constituted a before and an after in Spanish politics and society. It is true that the magnitude and dimension of the changes that were demanded have survived only as a series of much smaller transformations; and that this real democracy, increasingly broad and participative, has not just arrived as expected, but that the struggle for equality and social justice will continue beyond what we imagined, with advances but also with many setbacks. Society is created and recreated through social movements (Touraine, 1973), but also through the dominant elites and counter-movements (Pleyers and Álvarez-Benavides, 2018). As a consequence of the 15M, new parties and political formations have been born, citizen movements, new initiatives and ways of understanding and doing politics. But this is not a process confined to progressives. Conservatives, nationalists and even the far-right have also found new forms. The old politics, the traditional parties, have been affected by 15M. But clearly their readjustments rarely favour the demands made on the squares and at the assemblies. Instead they attempt to counteract the effects of the new policy, to recover their former predominant position and to continue dictating the game's norms and rules. In this see-saw also the economic elites, who were minimally affected, have mobilized to neutralize the impulses of both the post-2011 movements and their political translations. Nothing is a free gift under neoliberalism. But beyond political issues, the struggle between new and old parties, even the fact that we can already talk about a new policy, there is a transformation of mentalities. Although little time has passed, and it is difficult, in itself, to make an assessment on this type of transformation, it can be seen that 15M's sediment, as had happened with May '68 and as it would also go on to happen with the Arab Spring, will remain and will affect many generations. Therefore, 15M is history, present and future. The 15M movement is history itself, because it is a milestone that will be studied, read and remembered by generations of activists and citizens not yet mobilized, because it will be a mirror in which to look back, because whenever there is a demonstration or a new social movement is born, reference will be made to everything that had happened during those months and that will be newly disseminated, to a greater or lesser extent. Present, because today politics are already different, whether or not democracy advances. The very conception of democracy is already different for many citizens, even to some extent for those who are the furthest ideologically from 15M. Future, because many of those activists who experienced democracy in the squares or on social networks, continue fighting for the same reasons that called them to demonstrate, to make assemblies, to demand more and better democracy, more social rights and social justice in the first place. Some of them, from the new parties that make up the governments-for-change and that will form new governments and opposition governments in which policy will be made as had been envisaged, in part, during 15M. Others, most of them, throughout their daily life, in their neighbourhoods, with their neighbours, with their colleagues, with their families, will continue to make the politics seen at the squares, that of the assemblies, that of a local level. They will continue practicing day-to-day democracy in its purest form. They will continue to be outraged, and will continue to be 15M. Under the motto "We have been and will be again", people protest on the first anniversary of the referendum on independence, Barcelona. Sept.1,2018. Nicolas Carvalho Ochoa/ Press Association. All rights reserved. Álvarez Benavides, A. (2018). Elementos para el análisis de la nueva extrema derecha Española (Elements for the Analisis of the New Spanish Far-Right), en VV.AA. Continuidades y cambios en el estudio de los movimientos sociales (Continuities and Changes in the Study of Social Movements). Bizkaia: Betiko Foundation. Forthcoming. Touraine, A. (1973). Production de la société. Paris: Seuil, 1992. Oxfam report "Reward Work not Wealth". Housing reports from the Ministry of Public Works and the Idealista.com portal.